RBTH presents a selection of views from leading Russian media on international events, featuring reports on a phone call between the U.S. and Turkish leaders over the downing of a Russian fighter jet by the Turkish air force on Nov. 24, threats by Moscow to stop coal exports to Ukraine over sabotage to power lines supplying Crimea, and the possible departure from Russia of the “big three” rating agencies. The Moskovsky Komsomolets daily tabloid cites the Reuters news agency as reporting that the U.S. and Turkish presidents have held a telephone conversation to discuss the incident on the Syrian-Turkish border in which a Turkish jet shot down a Russian Su-24 bomber, and came to the conclusion that the conflict must not escalate. 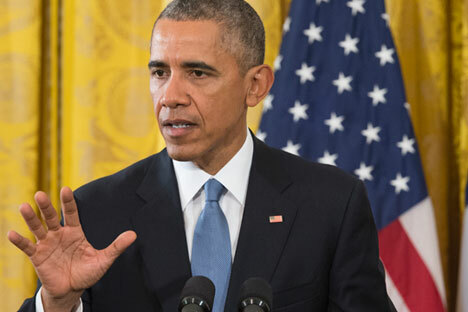 U.S. President Barack Obama said that "the U.S. and NATO recognize Turkey's right to protect its sovereignty," despite the fact that the U.S. sees the necessity of immediately defusing the situation. "The leaders agreed that it is necessary to reduce the tension and adopt proper measures in order for the incident not to repeat," announced the White House. The Turkish side interpreted this conversation in a different light. According to Ankara's official statement, "during the conversation the sides discussed the Russian plane that violated Turkish airspace and which Turkey shot down. President [Recep Tayyip] Erdogan and President Obama both said that they had agreed on the necessity to adopt measures that would prevent the incident from repeating and on the importance of reducing the tension. Moreover, the sides reconfirmed their resolve to jointly combat the ISIS terrorist group and guarantee a political transition in Syria." The Kommersant business daily reports that on Nov. 24 Russian Energy Minister Alexander Novak stated that Russia may decide to stop supplying Ukraine with coal as a retaliatory measure for the saboteurs who blew up the power lines supplying Crimea with electricity from Ukraine on Nov. 21. Although an official ban on exporting coal is still not in place, Kommersant sources say that yesterday coal stopped crossing the Ukrainian border. The refusal to export coal may be a blow to Ukraine's energy, as well as to Russia's coal industry. Since the rebel regions of Donetsk and Lugansk de facto separated from the country, Ukraine has become more dependent on coal, especially on the coal coming from Russia. In 2014 Russia sent Ukraine 5.6 million tons of coal and 4.8 million tons of coke. In the first nine months of 2015 the volumes were 3.2 million and 2.7 million tons, respectively (according to statistics provided by the Central Dispatching Department of the Fuel Energy Complex). Head of the Energy Development Foundation Sergei Pikin notes that Ukraine buys most of its coal from the Donbass, and the threats of Russia to limit its exports may vanish if Kiev restores the power lines to Crimea. Ukrenergo, the Ukrainian national power company, has begun repairing one of the four power lines, but this does not mean supplies will resume. The RBK daily cites a source close to the management of the "big three" international rating agencies as saying that the companies are considering leaving Russia, first and foremost S&P and Moody's. "The reason is the requirements of Russian law, as well as the European regulator's delocalization policies," said the source. Russian law requires all international agencies to create branches in Russia if they want to publish ratings on a national scale, that is, those that are used within the country, for example, concerning the distribution of state resources or credit at the Russian Central Bank. Currently, the rating committees of the "big three” are located in London, with only the agencies' representative offices in Russia. "Establishing a branch means that the agency will have to begin from scratch, create its own compliance service and translate internal documents into Russian. This is a lot of work and is very costly," said Dmitry Grishankov, general director of the Expert Rating Agency. The foreign agencies have half a year to make their decision. The transitional period will last until the middle of 2017. By then, if the agencies decide to work in the domestic market, they will have to establish branches in Russia, otherwise their ratings will become invalid. The source close to S&P and Moody's managements tells RBK that the agencies are considering closing the representative offices. "The global rating agencies think that they can rate our issuers from their London office," said the source.